Unlike other printing procedures, foil stamping reproduces a variety of shiny and eye-catchy designs using heat, pressure, foil films, and metal films. The printing service providers use foil printing to reproduce designs and graphics on metallic paper or foil. The specialty printing process further enables printers to create appealing designs and graphics on foils with varying colors, finishes, and optical event. At present, foil stamping technique is commonly used for producing a slew of stamped designs without using ink. Foil printing is often referred to as dry stamping as the printing process does not use any type of ink. Unlike conventional printing methods, dry stamping does not require printers to use ink or plates. Instead, the distinct printing process requires printers to stamp appealing designs and graphics on foils using dies or carved metal plates, heat and pressure. However, the foil printing process has been evolving consistently over many centuries. The application of heat and pressure make it easier for modern printers to produce appealing designs and imprints. The foil printing technique appears identical to engraving or letterpress. 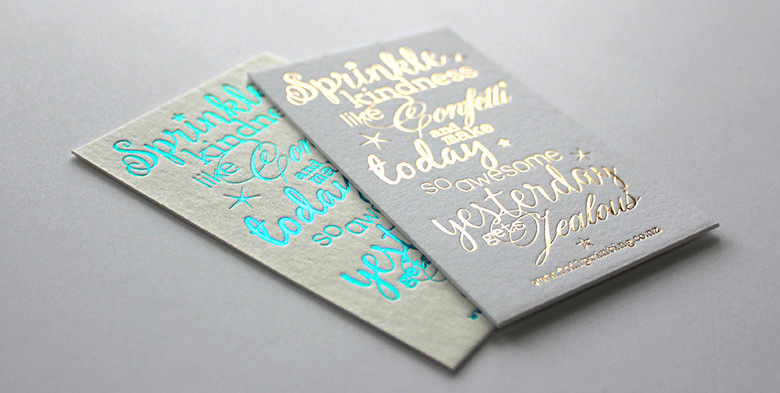 But unlike engraving and letterpress, foil printing does not require printers to apply color on papers with pressure. While using foil printing techniques, the printers have to create individual metal dies for each color foil. After creating the metal dies, they have to heat the dies and stamp the dies with adequate pressure to seal the thin layer of foil to the paper. They even need to heat and stamp multiple dies to add more colors to the design to accomplish the desired imprint. The experienced printers always compare different types of foil stamping according to the type and appearance of the finished product. If the finished design needs to look like rising slightly on the original surface, the printers opt for flat foil stamping as simple and cost-effective printing techniques. On the other hand, they opt for sculpted or multi-level foil stamping when they need to produce distinct and appealing results. Sculpted foil stamping requires them to carve the sculpted dies with hands. Likewise, the printers also use vertical and peripheral foil stamping degree of the circumference to be stamped. Like other printing processes, foil printing also has its own pros and cons. As foil stamping does not require printers to use ink, the color of the foil need not change according to color. The printers can stamp appealing designs on dark or colored papers using a light or metallic color foil. They even have the option to choose from a variety of foils – glossy, metallic, holographic, pearlescent and semi-transparent – to complement the specific paper color. But foil stamping, unlike conventional printing procedures, is labor intensive. The printers have to put extra time and effort to reproduce multi-color designs. Also, they need to exercise adequate caution to prevent the thermographic resins from melting while applying heat. On the whole, foil stamping is a special type of printing process that enables printers to stamp varied designs and graphics on papers without using ink. Superfast Copying & Binding can reproduce varying and multi-color designs by combining metal/foil films, heat, and pressure.